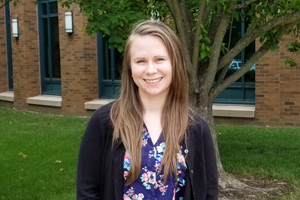 Ashle Bray, a second-year student at Drake University Law School, was selected as a Student Fellow for the Rural Summer Legal Corps, a joint program of Equal Justice Works and the Legal Services Corporation (LSC). The program provides direct services in underserved rural communities across the United States and its territories. As one of 30 Student Fellows selected from law schools nationwide, Bray will spend eight to 10 weeks during the summer gaining hands-on experience providing legal services and engaging in community outreach and education. During her Fellowship, Bray will work for Iowa Legal Aid, an LSC-funded civil legal aid organization and one of 26 host sites for the Rural Summer Legal Corps. She previously worked for Iowa Legal Aid, starting as a social work intern in February 2016. Throughout the summer, Bray will be providing legal assistance to low-income Iowans, focusing on victims of domestic violence and those seeking help with expungement and court debt. Specifically, she will be involved with the intake process, representing clients in administrative hearings and providing community legal education presentations. Launched in 2016, the Rural Summer Legal Corps is supported by Equal Justice Works, a nonprofit organization committed to mobilizing the next generation of public interest attorneys, and LSC, a nonprofit that promotes equal access to justice and provides grants for high-quality civil legal assistance to low-income Americans. As part of the Rural Summer Legal Corps, the Fellows attended training in Washington, D.C. from May 29 to June 2. Bray is passionate about helping her community and solving complex legal issues through a strengths-based, holistic approach. She will have ample opportunity to apply these skills in her Fellowship, and she is determined to make a difference.